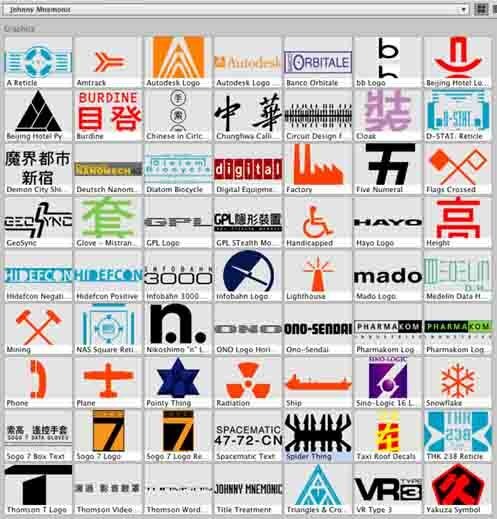 Added an obscure symbol, tweaked the Sino-Logic 16 logo, added the pyramid puzzle from the Beijing Hotel’s website. The count is now 63 symbols. Superficially, this the exact same frame that was used for promotional purposes. But what is the header at the top? It’s apparently dated 5:30 pm, May 13, 1995. JM was released in Japan on 15 April, and in the US on 26 May, 1995. This image seems far too late to be a screencapture from the editing suite (if it was edited digitally). And where are datagloves? Was this from the mastering for video tape / laserdisc? What is the name / logo in the upper left corner: Diamond Cine? Gem Cine? Incidentally, I had to retouch this image; the exposure was quite poor, as you can see in the unretouched image below. Perhaps the most elusive facet of JM is the Net Hunt. And what was that? Added the stretched “Thomson” wordmark, and the Chinese on the banner below it. Added text to the Demon City Shinjuku Japanese. 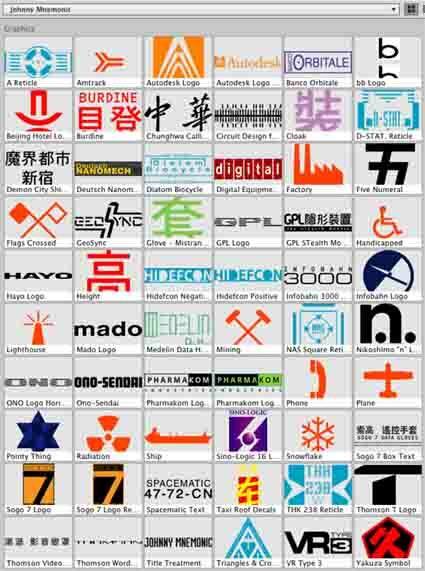 Tweaked the Sogo 7 logos. Added the Ono-Sendai wordmark, and the GPL Stealth Module logo. Thought I might have ID’ed the font used for the title treatment, but it was not an exact match. The count is now 60 symbols. Johnny Mnemonic: Behind the Scenes at Sony Pictures Imageworks! This is lifted entirely from the now-defunct Sony website, circa 1995. I present it here simply for the sake of completeness and ease of access, and do not claim any authorship or rights whatsoever. I have tried to maintain the original formatting wherever possible. I have also taken the liberty of inserting extra images and captions to provide more information. – Cyberspace as defined by William Gibson in his award-winning 1984 novel, Neuromancer. For artists in the visual effects industry, film adaptations of William Gibson’s books are the Holy Grail. No other writer captures the high tech future as imaginatively, as vividly nor as cinematically. 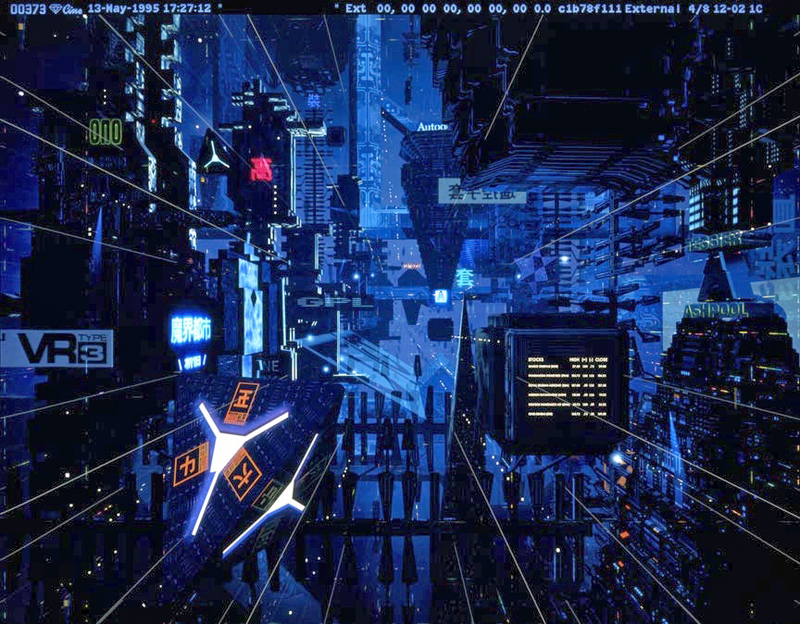 So it was with enormous enthusiasm that visual effects producer George Merkert of Sony Pictures Imageworks seized the opportunity to produce Gibson’s cyberspace for Tri-Star’s new release, Johnny Mnemonic. Merkert (Total Recall, In the Line of Fire) has been captivated by Gibson’s work for years. 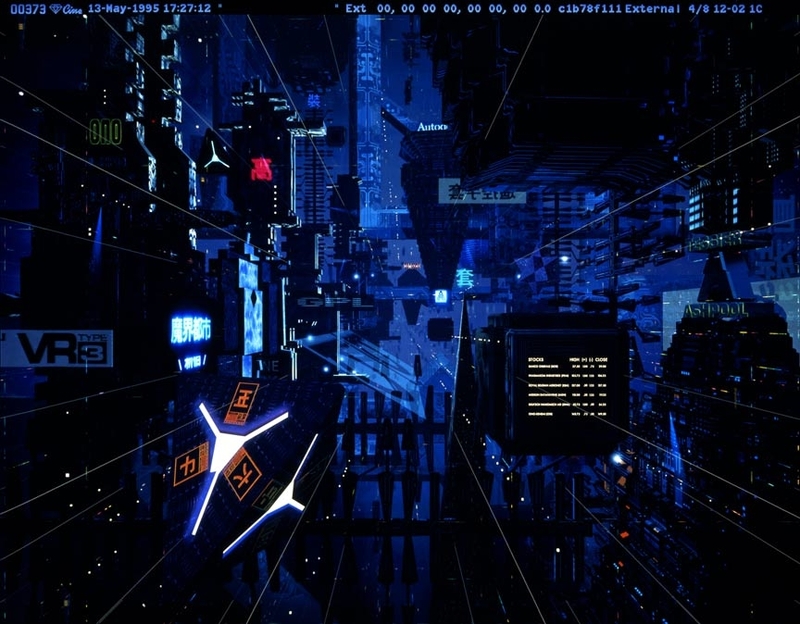 Since producing a test visualization of cyberspace in 1990 for director James Cameron, Merkert sought the chance to bring Gibson’s majestic idea to the screen. In early 1994, Johnny Mnemonic became that opportunity. Author Staff WriterPosted on June 20, 2015 Categories DesignTags ジョニーニーモニック, Johnny Mnemonic, William GibsonLeave a comment on Johnny Mnemonic: Behind the Scenes at Sony Pictures Imageworks! …Naturally, the depiction of cyberspace was a key element. Sony Pictures Imageworks and Braid Media Arts were the animation firms selected for the job of animating cyberspace. Sony was charged with visualizing Johnny’s phone interface sequences, and overviews of the Internet. The “can-opener” sequence and the final cyberspace encounter were Braid’s tasks, totaling almost two minutes of screen time.